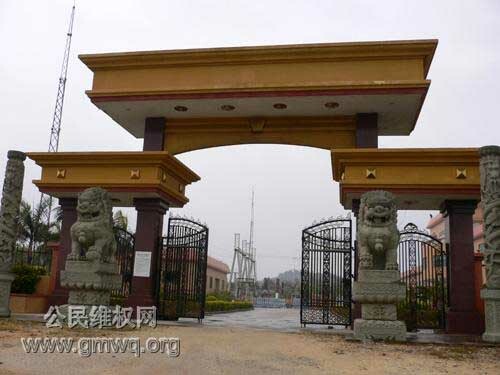 The following is a translation of the investigative report from GMRQ (公民维权网) (also at 王宁博客) about the incident at Dongzhou village, city of Shanwei, Guangdong province. Some of the more speculative and polemical portions have been omitted by the translator. 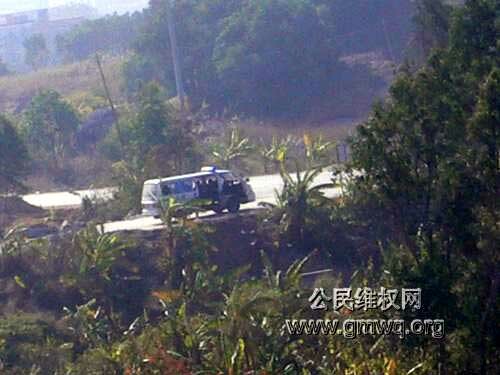 On December 6, the Guangdong province Shanwei city government sent out armed policemen to use firearms to suppress Dongzhou villagers, causing many casualties. When the news came out, the world was shocked and condemnations came from everywhere inside and outside of China. However, the local government imposed a news blackout and the Chinese media were silent. This meant that the overseas media and the official Guangdong government were issuing seriously opposing and contradictory reports. Objectively, a third-party independent investigation is called for in order to establish the basic knowledge about the facts of the Dongzhou incident, and thereby push for a fair solution within the legal framework. Recently, with the assistance of some civil rights volunteers, we were able to conduct an independent investigation at the scene. (Dongzhou Street and Dongzhouhang village. 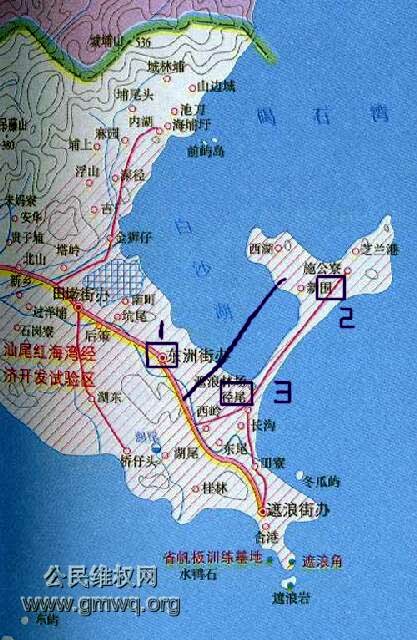 (Map of the Honghaiwan Economic Development Experimental Zone of Shanwei. The hand-drawn blue line indicates the new road that spilts Beisha Lake. 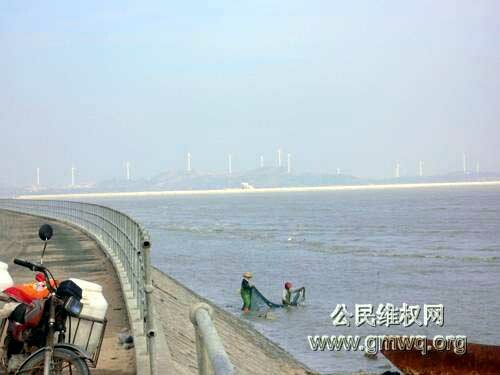 The road leads to the newly built wind power electricity-genearting plant at (2). 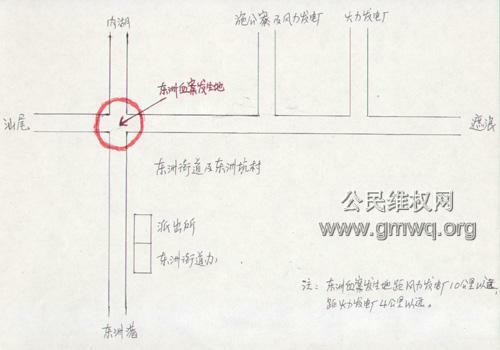 (Street map of Dongzhou Street. The red circle is the scene of the shooting. The road north leads to the lake. The road west leads to Shanwei City. On the road east, the first left is to the wind power plant. The second left turn is to the coal power plant. 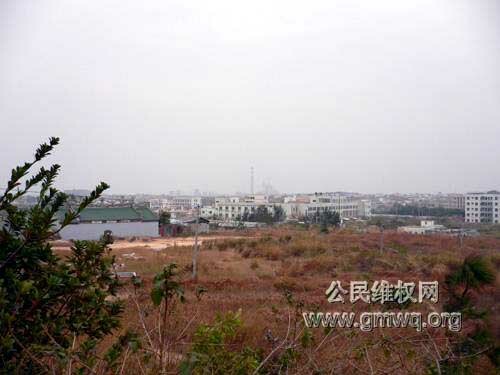 On December 5, 2005, there were rumors from other areas in Shanwei city that the government is assembling police forces to suppress the Dongzhou villagers who were trying to defend their land rights. 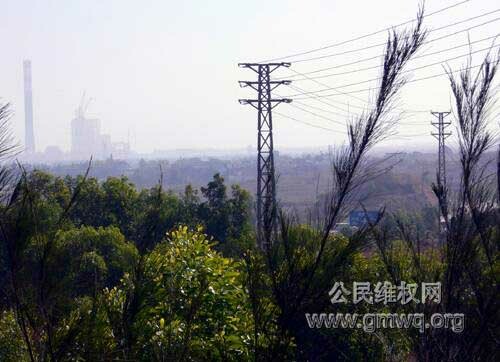 On the morning of December 6, several police cars went busily back and forth through Dongzhou village roads to the wind-powered power plant. 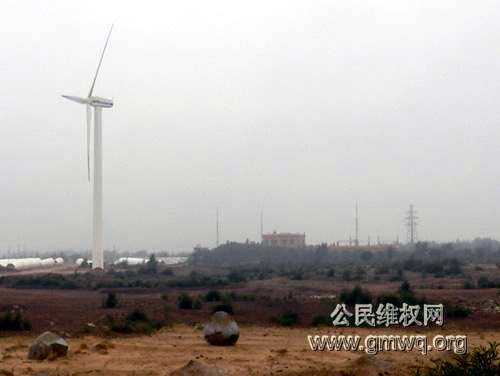 On the afternoon of December 6, several hundred villagers from nearby Shigongliao village went to protest in front of the wind-powered plant to protest land requisitioning issues. Several dozen Dongzhou villagers went there to offer support. 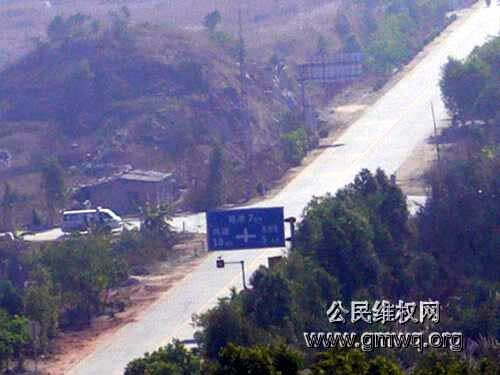 The police arrested two of the Dongzhou villagers, so the others went back to the village with the news. Around 4 pm on December 6, in order to prevent the police from taking the arrested villagers away and to prevent further attacks against the village by the police, the villagers began to set up roadblocks on certain intersections on Dongzhou Street. About two to three thousand villagers showed up, some of whom were carrying sticks, poles, fishing forks and so on, and there were even fishing detonators (according to the villagers, the fishing detonators are equivalent to large firecrackers used for fishing and were used to scare the police) and fireworks. But most of the villagers were unarmed. Around 5 pm, about 1,500 armed police officers and anti-riot police officers equipped with armored police vehicles, fire engines, machine guns, sub-machine guns and flamethrowers began to get into formation about 100 meters in front of the road blocks set up by the villagers. Around 7 pm, the police began to fire many tear gas canisters at the villagers and they pushed forward slowly. During the action, some villagers were hit by rubber bullets. When the villagers could not resist the gas, they retreated but they would move back up to the road block after the tear gas was dispersed. This sequence of events repeated itself several times. From about 830 pm to 900 pm, the police who were 50 meters away began to use machine guns and sub-machine guns to spray the villagers who were illuminated by searchlights. It is impossible to verify if there was any warning, since the villagers were inexperienced and there was smoke and gas everywhere at the scene. Since the villagers never expected the police to shoot, those who did not take evasive actions paid the price. Most of the casualties occurred during this period. Afterwards, there was a period during which the police did not attack any further. Some villagers claimed that the police were disposing of the bodies, but this cannot be verified now. The villagers facing the police at the scene did not learn until after 10pm that some villagers had been shot and died at the hospital. Then and only then they realized that shooting had taken place. Afterwards, to avoid more casualties, the villagers retreated inside the village. 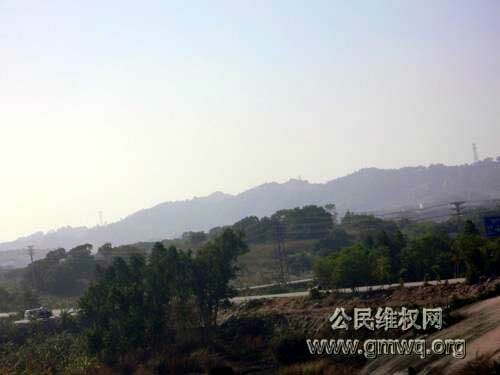 For the first time, the police went past the roadblock and then slowly progressed in several directions (towards the Dongzhou Street police station, the wind power plant and the coal power plant) and they fired at the brushes on both sides of the road with guns and flamethrowers in case villagers were hiding there. They demolished and burned down the tents and signs set up by the villagers at many intersections (including at the power plants). At the same time, the fire engines washed away the blood at the scene. The sound of gunfire did not stop until midnight. From December 7, the armed police surrounded and locked down Dongzhou Street and Dongzhouhang village. They forbade the villagers to go out and look for their missing relatives or to hold memorial services for the dead. They cut off communications with the outside. They used their propaganda tools to say that the government did the right thing and placed the blame on the villagers representatives and the participants. From December 9, they began to arrest the village representatives and other active participants. 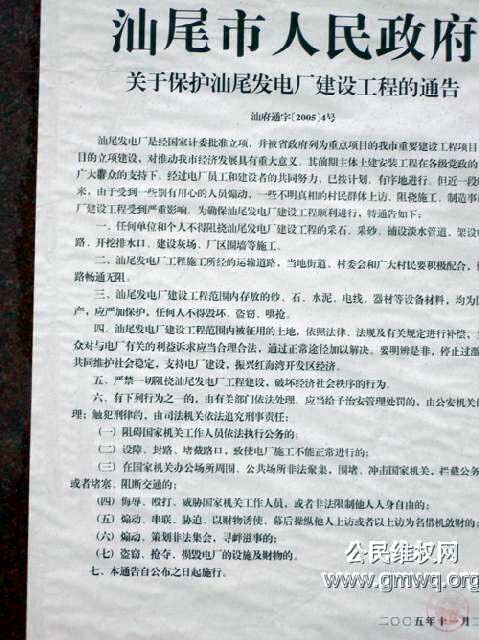 According to the Dongzhou villagers: as of now, it is known that three families have received sums of money for their deceased relatives in the name of aid (but not compensation); eight injured persons were treated, but the families are forbidden to look after or visit the wounded at the hospital, possibly to prevent the families from exchanging information with them; the injured have received no compensation; more than 30 villagers are still missing, and the villagers are worried that their bodies had been destroyed without a trace; more than 10 villagers have been arrested and held at unknown locations, without any legal explanation to their families. Some villagers claimed that the arrestees have been tortured. Some villagers have fled to the outside. (The intersection at which the shooting took place. (The intersection of the shooting. (Dongzhou Street and the Dongzhou police station. 1. 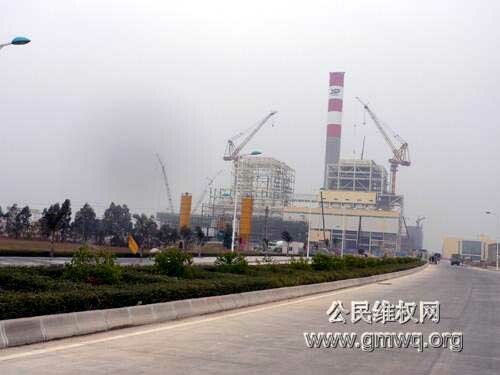 Prior to the incident, the wind-powered plant at Shigongliao and the construction site of the coal-powered plant at Dongzhou were not attacked or damaged as indicated in the official reports. 2. Although there were numerous people on both sides when the incident took place, they were distinctly segregated and kept a distance away from each other. There was no cause for confusion. 3. 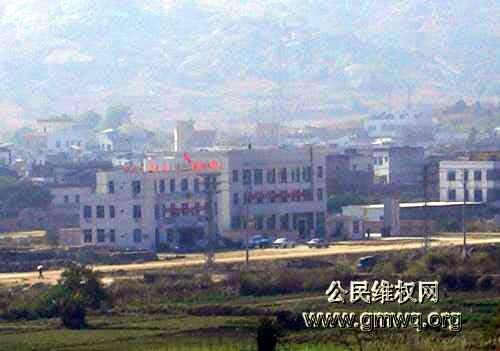 When the incident occurred, the Dongzhou villagers were in a completely passive situation. There was no way for them to effectively attack the police or cause critical and major damages, and there were no signs of any such effort. 4. The shooting began not as a misjudgment at the scene, but the police actively and deliberately caused it. 5. The number of civilian casualties in the Dongzhou incident is undetermined and unverified as yet. 6. From the fact that armed police officers were mobilized to the cover-up activities after the police shot the villagers, this whole action showed that it was planned, organized and deliberate. The shooting must have been approved beforehand by the superiors as an acceptable action if the villagers refused to retreat. 7. 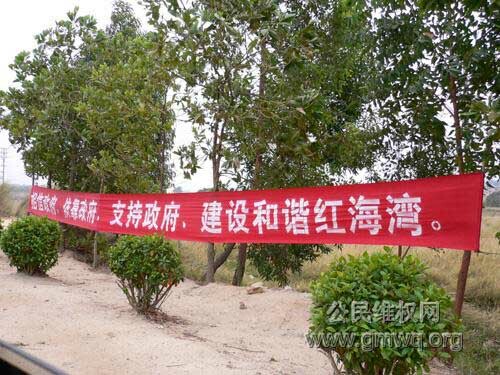 From the signs before and after the incident, and from our understanding about how the military police would use firearms only if they have the approval from superiors, the order to shoot definitely did not come from the police commander at the scene or even a Shanwei City official.